Two newborn wildcat kittens have been named after the new Disney/Pixar film. Kitten: The animals are settling into their new home. Twins Brave and Merida, named after the film Brave and the main character Merida, were born at the Highland Wildlife Park in Inverness-shire in April. They have been settling into their new home and are already practicing their pouncing skills. Parents, five-year-old Seasaidh and eight-year-old Hamish have been kept busy running after the new arrivals. 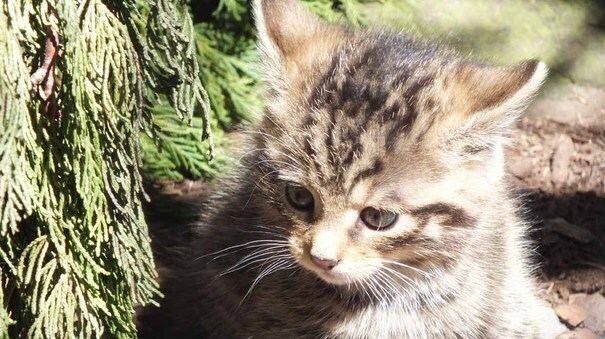 Una Richardson, head keeper at the Highland Wildlife Park, said: “It is an exciting time for the Highland Wildlife Park, as we welcomed the arrival of our twin Scottish wildcat kittens, meaning we now have six Scottish wildcats in total. “Twins ‘Brave’ and ‘Merida’, have become quite bold and are often seen exploring their enclosure and running along an overhead walkway. We think these little kittens are well suited to their names. As brother and sister they love nothing more than to play with each other, although I would say our male kitten is definitely the bossier twin! Scottish wildcats are one of Britain’s rarest animals with just 400 left in the UK.